One of a gang who attacked a man, kicking, punching and stamping on him after a night’s clubbing over the Easter weekend, has been given a suspended jail sentence. Burnley magistrates were told how Tom Mark Ireland (21) delivered multiple blows to victim Jamie Prescott, despite being restrained. The assailants had carried on even after an off-duty police sergeant tried to stop them. Ireland was finally arrested and was to tell police he was drunker than he had ever been when he was involved in the 7-20am violence, which was caught on CCTV. Ireland, of Wynotham Street, Burnley, admitted affray at Burnley, on April 4th. He was sentenced to 18 weeks in jail suspended for two years and must pay an £80 victim surcharge and £85 costs. Eddie Harrison (prosecuting) said the defendant and friends had been out drinking. 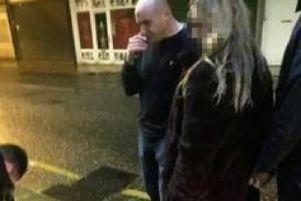 A large group was congregating at the back of Lava and Ignite nightclub and Ireland and two co-defendants were amongst them. The victim of the assault, Jamie Prescott was seen to throw a punch towards a 17-year-old co-accused and that led to the group involving the defendant pushing and shoving. Mr Prescott was chased down Hammerton Street and ended up on the ground, with five or six men punching and kicking him and stamping on his head. The defendant was seen to deliver a large number of blows, kicks and stamps, despite, at one point, being restrained. Other officers attended, the gang began to disperse into a smaller group and the defendant and others were arrested. Mr Prescott refused to give police any details about what took place and did not want to make a complaint. He was taken to hospital for treatment. Mr Harrison said Ireland was interviewed and shown the CCTV. The defendant, who had scuffs and cuts on his knuckles, told police he had had 10 to 12 drinks. He said he had been in Vogue nightclub when a blond, boyish lad had been goading him. Ireland claimed there was a dispute earlier on and he had forgotten it but he then saw the same lad being chased and tripped up. He claimed to have gone over and punched him a couple of times. Mr Harrison continued: “He said he had spent a lot of money on drink. It was the most drunk he had ever been.” Ireland, he said, added: “I have gone a bit far” The defendant had convictions for damage and threatening behaviour. Mr Mark Williams (defending Ireland) said he pleaded guilty at the first opportunity. He was extremely drunk. There had been an earlier incident between the defendant and victim and it looked as if the victim was trying to start trouble. Following the Easter Saturday morning incident police made an appeal for witnesses to come forward with information.